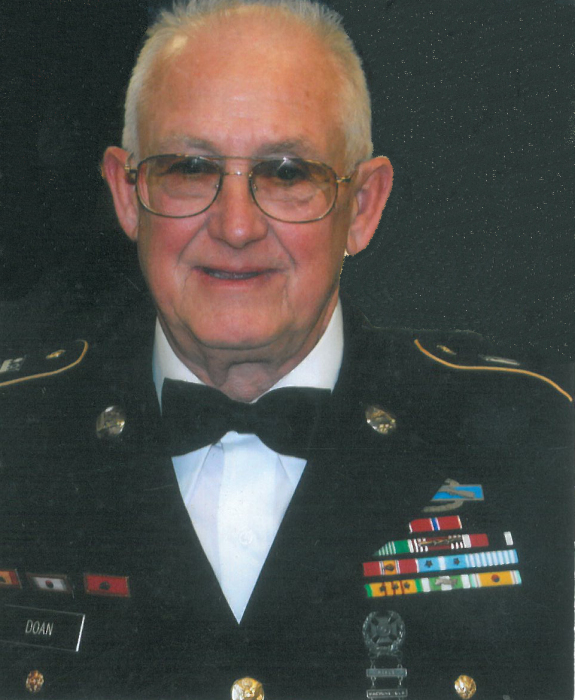 Master Sergeant Carl A. Doan (U. S. Army, Retired) passed away peacefully at his home surrounded by his loving family, Friday, November 30, 2018. Carl was born March 25, 1934, in Waupaca, Wisconsin. He was adopted at six years old and raised in Oshkosh, Wisconsin. At the age of 15, he enlisted in the U. S. Army. Carl served as an infantryman in the 17th Regimental Combat Team, 7th Division in the Korean War 1951 – 1952. He returned to the states a combat veteran with the rank of sergeant at the age of 18. Carl married Suzanne Yaeso and together they became a military family blessed with three children. Carl’s service took him, and at times his family, to California, Germany, New Jersey, Kansas, Georgia, Greenland, Thailand and finally Vietnam. Eighteen months after returning home from Vietnam, he retired from the U. S. Army at the age of 36. Carl settled in Green Bay, where he was the Golf Pro at the Woodside Golf Course. He then served the City of Green Bay Parks and Recreation Department as a special facilities manager. Upon his retirement from Parks and Rec, Carl and Suzanne took the opportunity to travel and enjoy retired life together. They especially enjoyed attending the Masters Golf tournament in Augusta, Georgia every year. Carl is survived by his wife of 65 years, Suzanne; son, Carl Michael, Green Bay; daughter, Elizabeth, Dallas, Texas; son, Anthony, Abrams; granddaughters, Jessie, New Orleans, LA, Elizabeth, Madison, Carolyn, Green Bay, Rebecca, Green Bay, and Arienne, Aiken, GA; and his great-granddaughter, Wallis. Visitation for Carl will be held Wednesday, December 5, 2018, from 4:00 pm to 7:00 pm at Lyndahl Funeral Home, 1350 Lombardi Avenue. Visitation will continue on Thursday, December 6, 2018 from 10:00 am until the time of the funeral service at 11:00 am at St. Paul’s United Methodist Church, 341 Wilson Avenue. Expressions of sympathy, memories, and photos may be shared with Carl’s family at www.lyndahl.com.